Pink diamond daisy engagement and wedding ring set. This wedding and engagement ring set is an exclusive design by Sherry Jewellery. It comprises of a 1 carat central pink diamond, surrounded by 1.20ct of fine white, pear cut diamonds. This forms the centre ring. 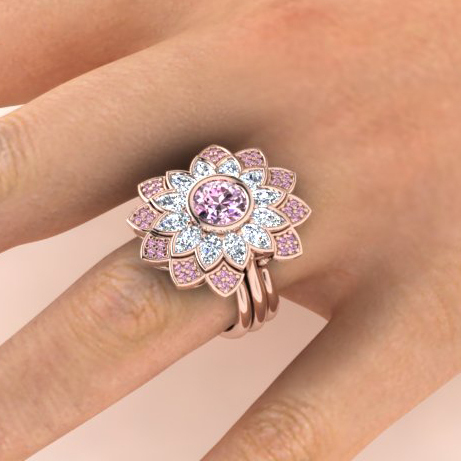 The outside array of petals is made with an outer ring either side of the daisy ring. These outer floral arrays are set with tiny brilliant cut, natural pink diamonds which are pave set. These are natural, Argyle diamonds, from the famous source of pink diamonds. The three rings lock together. The whole suite of matching engagement and wedding rings creates a stunning statement piece. The pink diamonds are set into 18ct rose gold. Red gold is often used to set pink diamonds as it enhances the warm, rosy colour of the gems. Sherry jewellery exclusive Design. We have made a variety of different daisy design rings. Each one we have created, has been unique to that customer. We pride ourselves in the exclusivity that we offer to our clients. This suite of engagement ring and wedding rings is an exclusive design. Created and produced by Sherry Jewellery. It is protected under IP laws and copyright.